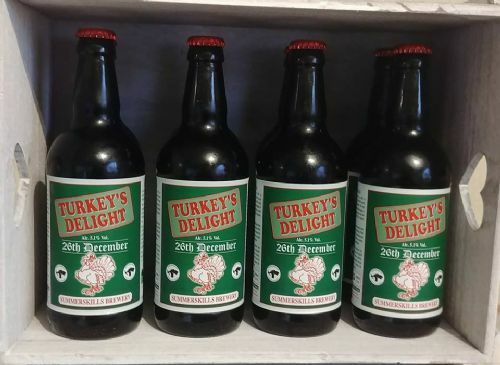 Summerskill's Brewery produce a range of cask and bottle conditioned “real ales” from ingredients sourced as locally as possible. Barley grown in Devon and Cornwall is malted at Tuckers in Newton Abbot. All of their recipes use whole leaf English hops mainly from Herefordshire and Worcestershire, with the exception of one aroma hop. The fermentation yeast is “wet” reducing the amount of waste yeast from each brew and allowing the strain to develop its own distinctive characteristics. The spent grains, the remains of the malted barley after mashing, are collected by a local farmer and fed to his cattle. Summerskill's beers can be found in pubs, shops and restaurants in Plymouth, West Devon, the South Hams and Torbay who are passionate about local produce. The brewery was founded in 1983 by Adam Summerskill and has been here in Plymstock since 1985.